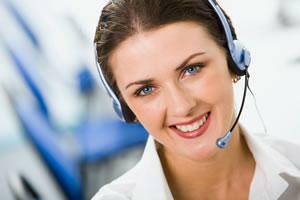 We’ve compiled a list of the most commonly asked questions and advice. Safety is at the heart of all of our business processes, we would therefore be grateful if you could take a few moments to read the advice below on how to handle and fit your new splashback. Your splashback is made in 6mm low toughened pilkington glass and conforms to BS 6206-EN-12600. All splashbacks are heat proof and can be used behind hobs and cookers the only exception being mirror splashbacks which should not be used behind hobs and only used where there is no direct heat. We can match any colour which includes all ral colours, Dulux, Crown Laura Ashley and Farrow and Ball. 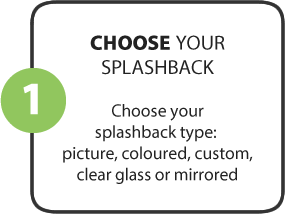 If you cant find your colour on our ral chart simply order white and than send an email to info@splashbacks.co.uk with your colour code and We will contact you to acknowledge We have your selected colour. We only use toughened low iron glass in all splashbacks that we supply unlike some of our competitors who use standard float glass. Normal float glass can distort the image or colour as the iron content gives a slight green appearance to the glass. Low iron glass gives a much sharper colour and image and therefore a better appearance. All splashbacks are polished, this is where the edge of the glass has been machined in order to give a smooth surface to the edge of the glass. Your splashback will arrive safely packaged and all packaging should be removed carefully on a flat surface. Your splashback will be foilbacked to protect the back of your splashback this should not be removed when you receive your splashback. Please use a standard tape measure and give all sizes in mm. Allow a 2mm tolerance all round your splashback if being fitted in an alcove or between walls. Remember – measure twice and fit once. If you require sockets or cut-outs, please ensure to input the details when ordering your splashback. All measurements for sockets are taken to the centre of the socket cut out. Single sockets are cut out at 75mm x 75mm this allows the face of the socket to sit over the cut out. Double sockets are cut out at 135mm x 75mm this allows the face of the socket to sit over the cut out. This way you will never see the cut out meaning you get a much better looking finish. When measuring the location of the socket, please watch and read our guide on measuring the distance from the bottom and from the side of the splashback area to ensure accurate cutout locations. Measure to the center of the cut out and enter your X and Y dimensions when ordering your splashback. 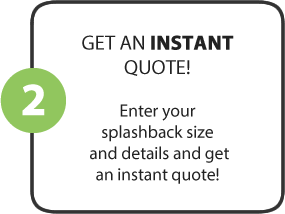 Your splashback although made from toughened glass should be handled with care and should never be placed directly on any hard surfaces such as floor tiles, granite worktops or tiles. Remember your splashback is prone to shattering if the edge of the glass comes into contact with these surfaces especially as the glass is at its most vulnerable when it is not fitted to the wall. Stand your splashback upright on wood or carpeted surfaces and try to fit your splashback asap. Always wear gloves and protective glasses when handling your splashback. Always keep unfitted glass in a safe place and keep away from children. Please ensure you have checked that your splashback is of the correct size. Apply either mirrofix glue supplied by us or a good quality silicone to the back of the splashback. The back of the splashback will have a protective foil backing and the glue should be applied to this. Use a silicone gun and apply the glue in lines down the splashback. Make sure a gap is left between the glue and the edge of the splashback, this prevents glue coming over the edge of the splashback when pressed onto the wall avoiding a mess. Make sure the wall the splashback is to be fitted is free from any loose materials and the wall is relatively flat. Sit the bottom of the splashback onto the wall, ensuring that it is sitting on 2mm spaces and not directly touching the worktop, cooker or tiles, have the top angled out towards you, therefore the bottom is now directly touching the wall and the top is angled out towards you. When you are happy with the position gently push the top of your splashback onto the wall. Apply light pressure to the splashback. Please leave the spacers for 24hrs under the bottom of the splashback so the adhesive has adequate time to set. Once the spacers have been removed silicone can be used to fill the 2mm space left by the removal of the spacers.